I have no idea what kind of music people are deflowering each other to these days, but it's probably not Edith Piaf. The film La Môme (The Kid) has been retitled La Vie en Rose for the American market after Piaf's big hit, and tries to introduce her work to a new generation using the tried and true Behind the Music approach. Olivier Dahan, Belgian videomaker-turned-feature-director, flashes forward and backward in the short and tragedy-laden life (1915&–1963) of the singer, played by Marion Cotillard. Edith Gassion was second-generation showbiz--third, if you take into account the fact that her grandmother ran a brothel. Plagued by spectacular ill health, the performer was done in by rich living, much substance abuse and a group of internal organs that simultaneously resigned in protest. If she overimbibed, she had an excellent reason: not just heartbreak, but a severe case of rheumatoid arthritis. Dahan alternates between the origin story and the endgame, even revealing one particularly sad event in Piaf's life at the very last minute. By this, the film seems to be trying to re-create the effects of Piaf's selective memory, though the actual effect, however, is more akin to taking the heroine and shaking her like a bug in a jar, between past and present. La Vie en Rose begins with a first public performance, the child Piaf bellowing out "La Marseillaise" when passersby aren't stopping to watch her father's street acrobat act. After her family is swept up into the Great War, Piaf is relocated to her grandmother's Normandy whorehouse. The young Edith is befriended by one of the ladies, Titine, played by Emmanuelle Seigner, who gives one of the few performances in the film that leaves an afterimage. Growing up in the brothel, Edith suffers from maladies; she's struck by temporary blindness, which is healed, as Piaf later claimed, by the grace of St. Teresa. 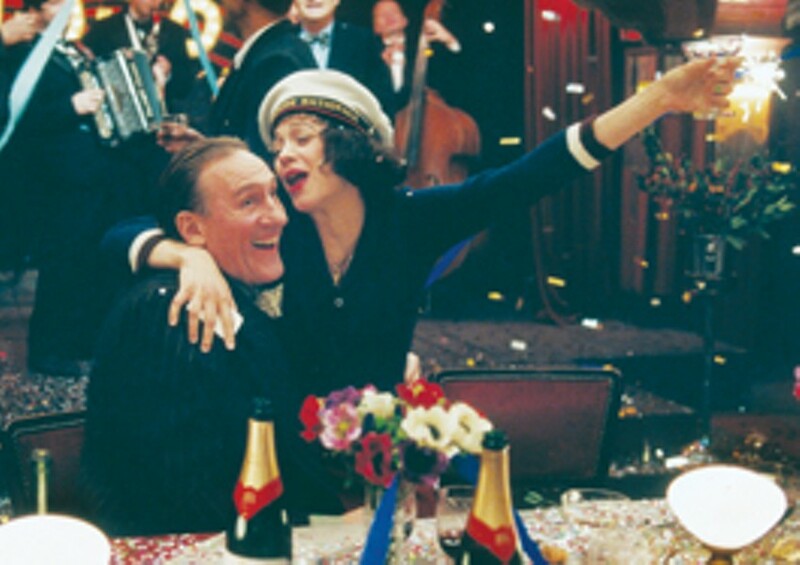 Piaf rises fast with the help of the impresario Louis Leplée (Gérard Depardieu); he refines her act and teaches her more mainstream stage deportment than the Apache-esque cabaret she'd been performing. But he too drops out of her life--violently. Post&–WW II success in America means little. "They don't get me, and I don't get them," says this version of Piaf, who in real life played the Ed Sullivan Show eight times. Obviously, somebody got her. In New York, she meets the boxer Marcel Cerdan (Jean-Pierre Martins), with whom she formed the most serious liaison of her life, despite two marriages. Martins carries the part with as little worry as Dean Martin might have done. His scenes are some of the most appealing parts of the film, maybe because the heroine is free of pain for a short time. Cotillard shows us the imperiousness of Piaf when she was famous, but there's a lot to be said for the less-fraught moments of Piaf's legend. Dahan is at his clumsiest handling the legendary figures in Piaf's life. During the walk-on by Marlene Dietrich (Caroline Sihol), one expects something memorable will be said. In Marlene Dietrich's ABC, the actress' book of received ideas and opinions, Dietrich called Piaf "the sparrow become Phoenix." But what we have onscreen is something on the lines of "Edith, meet Marlene." Jean Cocteau, who died on the same day as Piaf, turns up for a similarly inconsequential name drop. Dahan is nervous about the most golden parts of Piaf's legend--her resistance heroism in the war and the funeral that paralyzed Paris--stressing instead the symptoms of all her maladies. Dahan's plan of attack is more than warts and all--it's like warts and nothing but. If Piaf wasn't pretty (though she was prettier than this film makes her out), neither was her voice. In the raw husk of it and the burring trilled r's, there was a bray, a wail. The international hit described a life seen en rose, as if viewed through rose-colored glasses, but it was sung in a voice belonging to someone who knew what it was like when the whole world was black. 'La Vie en Rose' opens on Friday, June 15, at the Rialto Lakeside Cinemas, 551 Summerfield Road, Santa Rosa. 707.525.4840.